Quarterback Steve Threet has decided to transfer from Michigan. He released a statement saying that he has received his release from the team and he will be looking to play football elsewhere. Coming out of high school in 2007 as the #9 pro-style quarterback in the nation, he went to Georgia Tech. It's still unclear why he didn't continue his career as a Yellowjacket, but he transferred to Michigan after winter semester, supposedly to be the heir of the heir of Chad Henne. And that's exactly what he was. Henne graduated after the 2007 season and Ryan Mallett was anointed the starter...until Mallett decided to transfer to Arkansas. Suddenly, a team that had four 4- and 5-star quarterbacks on its roster in summer 2007 (Henne, Mallett, Threet, and Jason Forcier, who transferred to Stanford) was down to one. For a guy who was expected by most people to start the 2009 season at the top of the depth chart, this is a curious move. Admittedly, Threet did not fit the popular mold of Rich Rodriguez run-good-throw-bad quarterbacks. Still, for a 6'5", 230 lb. quarterback, Threet moved well. 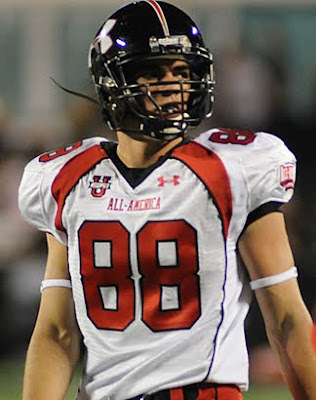 His decision-making was suspect, but after all, he was a redshirt freshman in 2008. Even a read-option-bred kid would have had a difficult time in the Big Ten as a youngster. The rumor is that Threet will end up at North Dakota State. I feel bad for Threet in a way, because this is not the way he saw his dream unfolding. At the same time, his notion of commitment is suspect. If he does indeed attend North Dakota State, that will be his third school in three years. I never heard a bad thing about the kid's attitude while he was at Michigan, other than that he was having a hard time picking up the offense. He's a hard worker, and he's been through a lot. Hopefully he'll be successful at North Dakota State and be the second coming of Matt Gutierrez. Reports surfaced late Sunday evening that Jerald Robinson, a wide receiver from Canton South High School in Canton, OH, would commit to Michigan. This came as a bit of a surprise because many (including me) didn't know Robinson had a Michigan offer. He's a Rivals 250 to Watch player and, therefore, probably in line to be a 4-star recruit. On Monday he made it "official" by announcing it himself. From what I've seen of Robinson, he's a good - not great - athlete. He's willing and able to catch the ball in traffic, whether it's across the middle or jump balls downfield. He's not a great route runner, but that will probably come. His speed is reported at 4.59; considering that many high school players exaggerate their forty times, he's probably closer to a 4.65 or so. He gets caught from behind too often for an elite athlete, so that's a question mark. Also a solid safety prospect, he likes to come up and support the run. His physicality is evidenced by his willingness to be a downfield blocker. 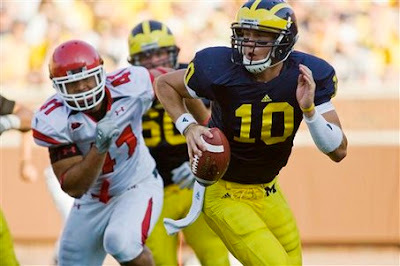 First of all, I will be somewhat surprised if Robinson is still committed to Michigan on Signing Day 2010. 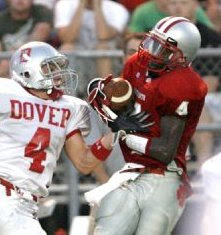 He is the third wide receiver commit for the class of 2010 and arguably the least talented. Early in the recruiting process, it was reported that he heavily favored Ohio State. Michigan offered Robinson (OSU hasn't yet) and perhaps won his favor because of it, but that doesn't mean he'll favor Michigan for the remainder of the process. There are several other elite Michigan receivers on their board, and I foresee - unfortunately - a decommitment on his part or a Jordan Barnes-like mutual parting of ways. If Robinson does stay on board, he's a physically mature receiver who might be ready to contribute early. However, with the glut of outside receivers expected to be on Michigan's roster in 2010 (Hemingway, Clemons, Stonum, Roundtree, and fellow 2010 recruits Jeremy Jackson and Ricardo Miller), I doubt Robinson would contribute as a freshman. It's quite possible that he'll redshirt.